Maria and I had a wonderful night out this evening with our good friend Felipe, and then we searched for a taxi home. It seemed that all the taxis we tried to flag down were full, so finally we did manage to find one using an app. 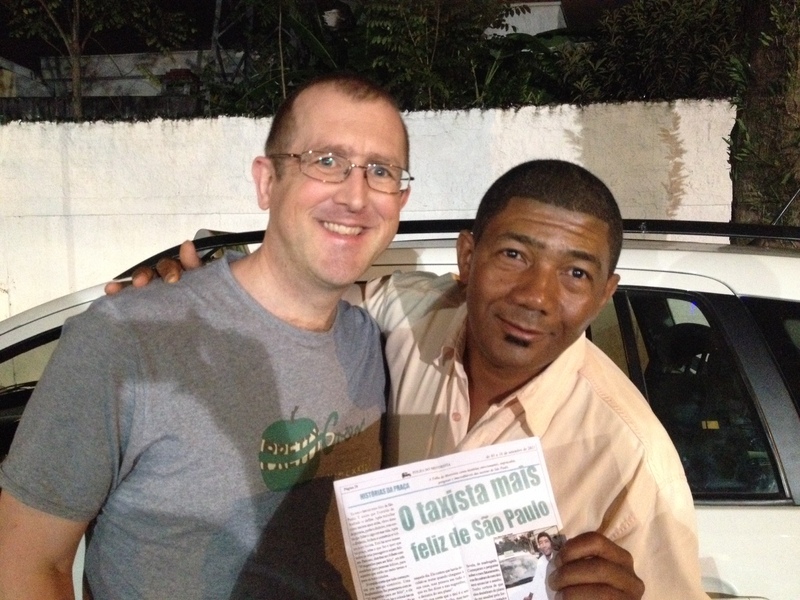 The taxi driver we encountered this evening is, officially, the happiest taxi driver in São Paulo. Really, what an experience! 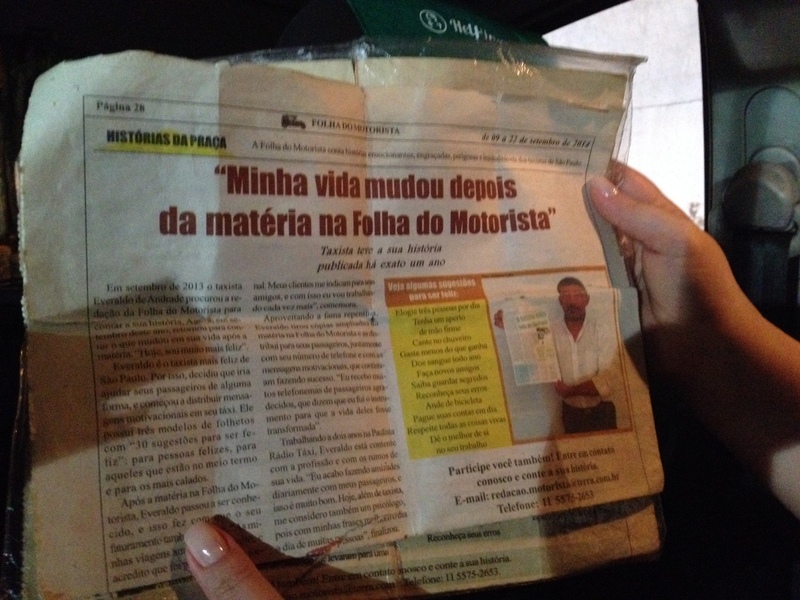 Everaldo starts the ride by telling us he is officially the happiest taxi driver in São Paulo, proudly showing us a cutting from a local newspaper. What we don’t yet realise is that is now evaluating our levels of happiness, and he will ask us a question, with one more at the end of our journey. Along the way he tells us a little about his life (and he has had some hard knocks) as well as sharing a little of his philosophy. At the end, he scores us out of 3 (1 is the happiest and 3 the least happy), and then hands us a piece of paper. This piece of paper has 30 hints for how to be happy in life, but we can’t show it to you. He says we are free to photocopy it and pass it on, but first we must be happy in ourselves, since how can we help others to be happy unless we are happy inside? I guess I could photo the paper and show it to you, but it doesn’t feel right. However, as you can see in this picture below, there is another story in a newspaper saying how Everaldo’s life changed after appearing in the newspaper one year before. So there you have it – I just wanted to share this rather marvelous taxi ride this evening with the happiest taxi driver in São Paulo. Everaldo has even been on television, and for the Portuguese speakers, here he is.